We received our April 2014 Bluum Box today and I was very excited. There were some pros and cons about last months Bluum Box. So I was hoping this Month would be better. I have to say though, after contacting Customer Service last month and telling them how I feel, I was very surprised. They were very kind, understanding and especially they reply fast. I do not like when I can not reach the company. That is just not professional to me. I worked in the Customer Service Department and learned, that the Customer comes first and it should be super easy to get in touch. But anyways, I give kudos to the Bluum Customer Service team. They are doing a great job. - A Priddy Book called 'Noisy Zoo', our daughter loves books and recently started wanting to know more about specific animals. She is really interested in Lions, Monkeys and Elephants, so this will be perfect. The books says 1+ on the back, but the text in the book has information about the animals that, I think, kids 2 and older can actually understand. Amazon sells this book for 8.99$. - Two Melissa and Doug Peg Puzzles, one is about shapes and one about the alphabet. I just wish our daughter would like Peg Puzzles as much as other kids do. But I think these are great. Especially since now they actually start to show interest in Shapes and Letters. These Peg Puzzles sell for 7.99$ each on Amazon. -A Pink Myself Belt, I really like the idea of a belt for kids. Especially since they can use this one by them self. Our daughter just recently started wanting to do everything by her self. Also this is perfect because our daughter is very narrow, so usually pants never fit her right. But I bet this cute belt will help her so that her pants don't fall down. This Myself Belt sells for 16.95$ on their website. I liked it but I've noticed that you can't use too much or your hair will look kind of raggedy/stringy/unhealthy. I think I also used a bit too much because I had some powder still in my hair even though I kept brushing and brushing it out. But it is a nice product, and I will use it again just to see if using a bit less will make it work better. This product sells for 18.54$ on Amazon. All together I am very happy about my April Bluum Box. The products are great and my daughter will be super happy about her book, belt and hopefully also the Peg Puzzles. Before I start with my April 2014 review, here are two reviews from March 2014. So I was very surprised when I tracked my April Box, because it was supposed to arrive one day earlier then predicted. We received the April Box for a 2-3 year old Girl. - A Flower Set from Green Toys, which was custom made for Citrus Lane. The Big Bouquet Set costs 19.59$ on Amazon. I wish we would have gotten the Big Bouquet version. - A Set of 2 Tumblers from Green Eats, which I really like. I personally just think they are a little too big to be tumblers for 2-3 year olds. A smaller size is easier to grab for small hands and the outside of these seems very slippery for toddlers. This Tumbler costs 5.99$ on Amazon. This book costs 8.99$ on Amazon. I really like Barefoot Books, so I am very happy about this book. It is about a Prince who refuses to go to sleep and it also includes a story time CD with 2 versions of the story. - A Sample of Mrs. Meyers Clean Day Lemon Verbena Dish Soap. This Sample is 2 Fluid Ounces and the 16 Ounces one costs 2.99$ on their website. I love the clean lemon scent and also the fact that it cuts grease and is biodegradable. - Also we received a Free Card offer from Treat. I was very excited about this, until I saw in the fine print that this is for new customers only. That's a bummer. I have been a customer with them for more then a year now and love their products and quality. So all in all this is a neat April Box, but If you add up the numbers then it comes very close to what the normal monthly Box costs and there were a couple things I didn't like about some products. 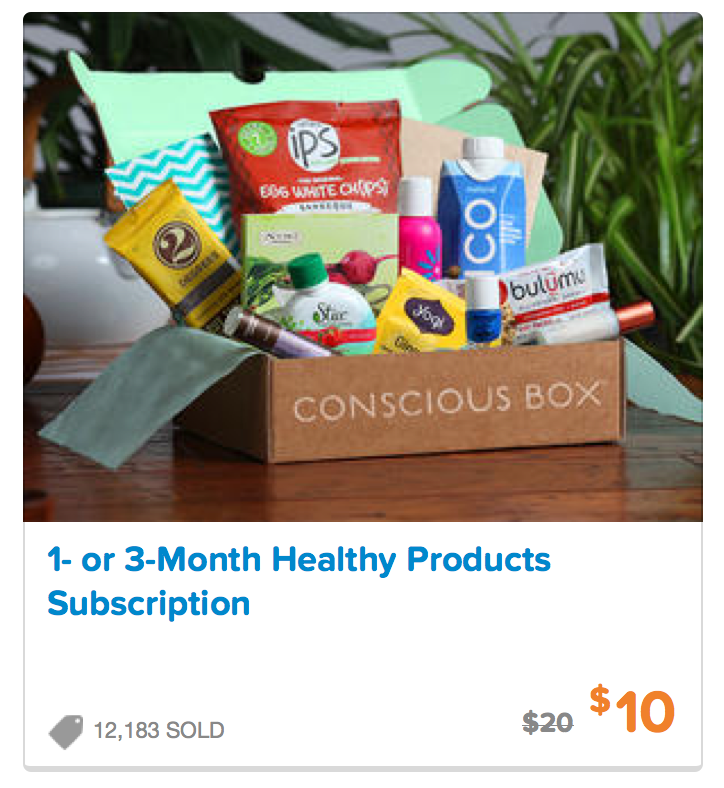 I just found a great deal for the Healthy Product Subscription Service, Conscious Box. I actually found it here, on Living Social. Conscious Box send out natural, GMO-free goods to try. I am vry excited to receive my box next month. They offer 2 different sizes, the Taster Box and the Plus Box. The Living Social Deal is actually for the Plus Box which is a great value. I received a Jergens® BB Body Perfecting Skin Cream Sample. I applied it on my hands, just to try it out, right when I received it. It is very moisturizing and it sank in my skin right away. It did not leave a greasy film or anything, just softness. The Jergens® BB Body Perfecting Skin Cream made my hands feel hydrated, even and firm. I love the smell of this Skin Cream, it is a sweet and clean smell. Very impressing is also how big the sample is. I will definitely be able to use it for quiet a bit. Thank you to Target for offering a great sample. And Thank you to Jergens® for making such a great product. A little while back I received a free product thanks to Smiley360. This product isn't something you can use every day though, so I was waiting for the right moment. And the moment came this week, when I started to feel a weird spot on my lip. And I knew it happened again, a Cold Sore. My mom gets them all the time and so do I. I dislike them so much, they itch, they hurt, they look nasty and I just want to hide until the Cold Sore is gone. So I was very pleased I was able to apply for the Orajel™ Single Dose Cold Sore Treatment Mission from Smiley360. So as soon as I felt the cold sore popping up I used the Orajel™ Single Dose treatment. It was super easy to apply and took all the itchy pain away and made my lip feel very numb. Thanks to the Topical pain reliever. I felt like it worked right away. I didnt feel the usual tingle and the Cold Sore didnt get too big. Since one dose wasn't enough for my Cold Sore I also used the Second Single Dose that comes in the package and that did the trick for me. My Cold Sore disappeared faster, I didn't experience the weird itchiness on my lip and I felt like a normal person again. I will definitely buy this product again next time I feel the tingle on my lip again. This is a great and easy to use product. Here is a link for a special coupon that Orajel™ provided. ARM & HAMMER(™) Baking Soda , Fresh Guard(TM) by Efferdent(TM) , PERK® Vent Wrap and ARM & HAMMER(™) Truly Radiant™ Spinbrush and Toothpaste. And you can join Smiley360, just click here. This is our first time receiving a box from Love with Food and I was very impressed. The products are great and 3 out of 8 samples are already gone. We already tried the Meli Honeywaffle and it was delicious. I have to admit though that I already had them before, because they sell them at various stores where I am from (Germany). I always loved them, it is like 2 thin waffles filled with a layer of honey. It is like a soft cookie but not too sweet. It has just the right sweetness. We also ate the Bumble Bar and I added a picture below. So this picture below is the Bumble Bar, I wanted to add this picture so that you all can see the texture. I didnt know what to expect from this bar and I wanted to show others what it looks like. The taste is amazing, I like all the sesame seeds and the almonds. It works very well together. We also tried the Creamed Honey with Chocolate Mint (on the left in the picture below). At first I was skeptical about this item, but my husband wanted to try it. It is delicious and we love the rich flavor. It tastes more like chocolate and mint than anything. Great, rich Flavor and Thick Consistency. We havent tried the Glazed Almonds yet (on the right side in the picture below), but I love Almonds so these will be a hit. We also received an Organic Fruit Spread Sample, Cheddar and Hatch Green Chile Popcorn, Orchard Blend Crunch Dried Fruit and a Hibiscus Flower Heart-Tee Sample. I cant wait to try the other 5 items, I know our daughter will love the Crunch Dried Snacks and my husband will steal the Popcorn. I will try the Strawberry and Wild Strawberry Fruit Spread later this week, when I make fresh bread. What I was also very impressed with, is the fact that we dint just receive the samples. The Glazed Almonds had a coupon with them and the Heart-Tee had a great Flyer with it. It included ideas, to make Popsicles and Iced Tea with the sample. I love that. If you are interested in trying out Love with Food, follow this link. Look, another great boxes from Smiley360. I received these PERK® Vent Wrap for free from Smiley360 in exchange for my honest review. You can join too, just click here. We received Four (4) samples of PERK® Vent Wrap in a variety of fragrances (Absolute Zero, New Car, Clean Laundry and Golden Vanilla). My husband stole the Absolute Zero and New Car for his car right away and I attached the Clean Laundry to the vent in my car. Smiley360 also send us a 1$ off coupon in the same package and we will definitely use it. Clipping it to the vent was super easy. I love that it is invisible and that is doesn't block the vent. It made my car smell fresh and was not too strong. I am sensitive to smells in the car and easily get nauseous, so I am very pleased with this PERK® Vent Wrap. It is hidden under a black protective cover, so not visible, and just fresh instead of having an over-powering smell. Great Product and we will definitely buy more. and ARM & HAMMER(™) Truly Radiant™ Spinbrush and Toothpaste. As I mentioned before here, since 2 weeks we are subscribing to Graze boxes. We got our first box free and loved it so much, we continued their service. If you are interested in getting your first and fifth box for free also, follow this link. Here is the review for our First Box and here for our Second Box. Our Top Favorites by far are their Flapjacks. They describe them as 'rustic rolled oats' and then they add either honeycomb and chocolate drizzle, apple and cinnamon, berry-infused cranberries, chocolate and orange or mixed seeds and dried fruit. We love them because they are very soft and chewy and they taste so good. I wish they would send me just a box with 4 different flapjacks. I also like that they aren't too sweet. Unfortunately, we just had flapjacks in our First Box. We recieved the 'Summer Berry Flapjack', thats the one with the berry-infused cranberries. It was delicious and one of the first items of that box that we enjoyed. So when I opened our new Graze Box the other day I was so excited because we received the Honeycomb Flapjack, the Pina Colada Fruit Mix (with pineapple, coconut flakes and mango, the Florentine Mix (containing pumpkin seeds, dark chocolate buttons and cranberries) and the Bonnie Wee Oatbakes (that is red onion marmalade with cheese and chive oatbakes). So far we tried the Flapjacks and really liked them, but we also tried the Pina Colada Fruit Mix and Florentine Mix and were positively surprised. We are very excited what kind of surprises our next boxes will bring. Again if you are interetsed in trying out a free box ( and also receiving your fifth box for free) follow this link, you wont regret it. Look what the mailmen brought. He is super busy lately bringing me all these great boxes from Smiley360. I received this ARM & HAMMER(™) Truly Radiant™ Spinbrush and Toothpaste for free from Smiley360 in exchange for my honest review. You can join too, just click here. ARM & HAMMER™ Spinbrush Truly Radiant™ Deep Clean Battery Toothbrush came to the right time. I tried it out right away and what I really like is that this Battery Toothbrush is wider then other Battery Toothbrushes. I really liked how it felt in my hand. I also like that it has a switch to tun it on and off instead of buttons you need to push. Personally this is way easier for me, since I always had a hard time pushing the buttons on Battery Toothbrushes. The only thing that I noticed was that the ARM & HAMMER™ Spinbrush Truly Radiant™ Deep Clean Battery Toothbrush is a little louder then other Battery Toothbrushes I had before. I dont mind it though. I also tried the ARM & HAMMER™ Truly Radiant™ Toothpaste with it and I really like the Mint flavor because it is not too strong. My mouth and teeth felt very fresh and clean. I have never tried a toothpaste that has baking soda in it and tingled a little bit when I used it for the first time. But it also made them feel super clean. I am very excited to try this Toothbrush and Toothpaste over the next few days to see how the Combo will clean and whiten my Teeth and also how it will give them strength. Visit this website to receive a free sample. Oh my, I am so excited for dinner!!! I found a great offer for a new Subscription service the other day. It is called Plated, they offer 7 chef-designed recipes each week. The weekly dishes always include 4 healthy meat & fish options and 3 unique vegetarian dishes. After you decide which recipes you would like to receive you type in your ZIP code and they offer you certain delivery dates for your region. The items will arrive that day in special packaging, so it all will be fresh and ready for your dinner. The fresh ingredients will be delivered with a step-to-step recipe card, so that you can surprise your family with a special meal. What I really like about this service is that they use locally sourced ingredients, like for example they always try to use local, seasonal produce and meats from local sellers. I chose 2 different recipes for today and tomorrow (yes it will also be fresh until tomorrow, another great perk), Citrus Soy Chicken Thighs with Soba Noodles and Lamb Meatballs with Orzo and Asparagus. I chose these recipes because we love Japanese Noodles, Chicken and we rarely eat Lamb. So these 2 recipes just caught my eye. When I opened the package for the Lamb Meatballs with Orzo and Asparagus recipe I could smell the great spices and I am just so excited because I love Orzo, Asparagus and Feta cheese. I marinated the Citrus Soy Chicken Thighs for almost 3hours in the fridge just so that they get some good flavor. This is how it all turned out, my husband and I really liked it. The Citrus Soy Chicken Thighs were very juicy, the noodles had great flavor and especially the sauce we used to marinate the Citrus Soy Chicken Thighs was delicious. Even our picky toddler liked the Citrus Soy Chicken Thighs, Soba Noodles and cucumbers. Again it was super easy to prepare and follow the instructions. And Voilà, here is our delicious lunch. My husband and I loved it. He especially liked the soft Orzo with the 'crunchy' Asparagus and the special flavor of the Lamb Meatballs. My conclusion after 2 great meals is that, this is an exceptional service and the quality of the food is great. We will definitely order again, because we still have to try one of their fish recipes and one of their vegetarian dishes. If you are interested in checking out Plated follow this link. As you might have seen here, I am a member of the Smiley360 community and I was offered another mission. Since I wear removable clear braces, I was approved for this mission and I am very excited. Because people, like me, who wear a retainer, mouth guard or clear braces are probably not getting them as clean as they want , and worse, they may be damaging them. Brushing can actually scratch your device, creating spaces where bacteria can grow. Mouthwash simply doesnt fully remove the mouth film that collects and may cause damage to the plastics or metals these devices are made of. But the new Fresh Guard™ by Efferdent™ is specially designed to effectively clean your removable dental devices without causing damage. I received this great starter kit that includes, 2 soaks + 1 wipe for on the go and a 1$ off coupon for my next Fresh Guard™ by Efferdent™ purchase. I tried the soak last night and it just took 5 minutes, I know other cleaners can take much longer so I was happy. I took it out after the solution turned from blue to clear and rinsed it off. I was very impressed with how clean my clear braces were. This product is really great and I am so happy I got the chance to try it out. Thank you for Smiley360 for sending me this great starter kit and coupon. If you are interested in the new Fresh Guard™ by Efferdent™follow this link to sign up and receive coupons. And if any of you is interested in trying out products and signing up for Smiley360, here is the Smiley360 link. Smiley360 is a great company, they send out Missions to they members and you have to finish a survey to get approved and then they send out a free sample courtesy of Smiley360. This time I got approved for the ARM & HAMMER™ Baking Soda Mission. We love ARM & HAMMER™ Baking Soda because it has so many uses, it removes stains, odor and you can use it for you Spring Cleaning. Our family especially uses it in our fridge and trash against odor, for laundry stains and for cleaning our bathroom floors. If you are interested in joining Smiley360 and checking out great products, click here.